417 Days A Year: Chemo gives me Superpowers! It may sound ridiculous both to those that have gone through chemotherapy and to those that have not, that chemo' makes me feel like Wonderwoman but I kid you not, in some ways, it really does. Don't misunderstand me, it comes with side effects and they are not pleasant. I have been lucky enough to have a month off work to give my body the best possible chance of coping and it has been a good move suggested strongly by my family doctor. I will go back to work in some capacity shortly though and take it one day (if not one hour) at a time. I will do what I can do and no more. My health comes first and when I work I want to be able to give 100%, both during and after treatment. I have been hit by many of the effects that are the norm' for my first 4 treatments (the second of which was yesterday) and also by the effects of the injection that I receive the next day to increase my immunity which is knocked down by the treatment. What I have been able to achieve though on the good and not so good days and how I managing so far, has made me feel like Wonderwoman. I know others think of me as strong but the unknown is frightening and I had no idea how I would cope. I have found that the care, the drug regime and the support of those around me is enabling me to draw power from places I didn't know it lay and for that I am most thankful. The chemo' ward is great and my nurse Tzialla is lovely. We communicate in a rudimentary way as my Hebrew really isn't up to the same level as hers but she makes sure that I am confident with exactly what I need to know and makes it a very pleasant experience. She is warm and caring and this doesn't change because she knows I don't understand every word. Her patience and empathy is also giving me strength. I love the fact that the hospital staff deliver free soup to patients and those accompanying them, free coffee and tea is on the ward and people from numerous charities come round giving out sandwiches, cakes, biscuits and all sorts of treats! Not forgetting of course the clown, who is the highlight of my chemo' trips. 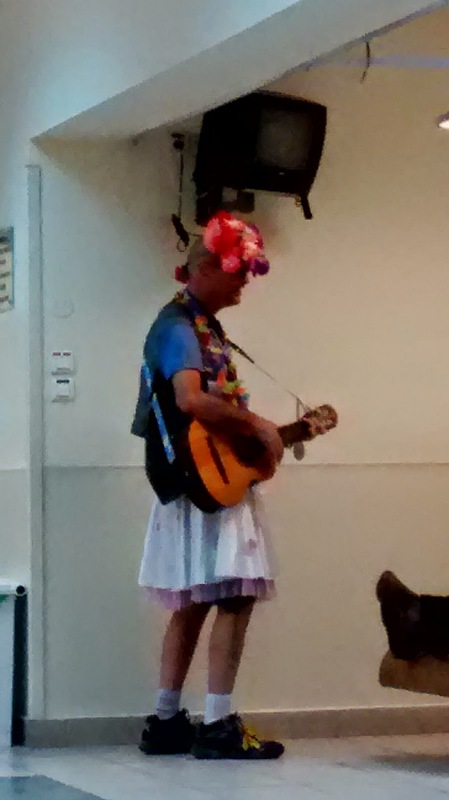 He plays guitar, stops and chats with people and plays them tunes and sings, tells jokes, he even answered my husband's work phone and sang to his colleague, which in no uncertain terms had us almost on the floor in hysterics. I would love to have seen her face! He has a special sense of style. This was yesterday as he entered the ward. he stopped to serenade an older Spanish speaking woman. He sang her a Spanish song and she sang along with gusto! The joy he brings to the chemo' patients is really hard to describe but very obvious to see. This one was from last time! He really cracks me up. The last month has been a whirlwind as I expected but I have had a lot of fun and done some amazing things. Two nights after my first chemo' I went on a work's night out. It was great to put faces to some of the names that I work with. We work remotely and only see each other during training and night's out so meeting new faces was great fun. I had a headache throughout but as I would have had a headache if I had stayed home, out I went. On day 3 I had my hair cut very very short. It was an inch long at its longest point. I know that with my treatments total hairloss is a certainly. I was worried that if it fell out during my planned trip to the UK I would be distressed and it would be hard to deal with. I was offered the chance to have my hair cut for free by a young hairdresser whose mother had suffered the same before me and he sent off my hair to make wigs and refused to charge me! I hated the idea of it falling out over my pillow or in my food and having short hair really made me feel more in control with what I knew was about to happen. On day five I flew with my husband and son to England. The flight wasn't great because I wasn't feeling good but we made it and the alternative was staying home alone, something I wasn't going to do. I spent a few days with my parents while my husband and son went up north to visit his sister and our nephews and then the three of us went to Limmud, a five day conference that we go to most years. I was able to participate at a different level to usual but participate nevertheless. The inclusion team made sure that I had access to the mobility bus so I didn't have to walk around the campus when too tired or when I hurt too much. There was our resident conference paramedic on site at all times and with Zeb around, I had no fear of becoming suddenly ill or needing help. I did miss a morning where I couldn't move and an afternoon where I had to nap but I still got to spend time with friends that I don't see often enough, enjoy music and comedy and workshops and lectures and crafting and bar time. I even had a bottle of lovely locally brewed beer - a real treat. I rested a lot and spent a lot of time just sitting in chilled surroundings and chatting or reading but it was a great break and I am so happy that we managed to sort out the insurance required so that I could leave the country and go. It also came with the benefit of not having to cook for 5 days. On day 14, just as predicted my hair started to fall out. When the chemo' attacks the fast moving cancer cells it also attacks other fast moving cells in the body and this is why hair dies and falls out. It is only a side effect during the treatment and usually hair starts to grow once the treatment is finished. I was ready for it to happen and as I ran my fingers through my hair, or pinched it lightly, out it came. Strange again as it may sound I was so happy when this started to happen. To me, it meant that the chemo' was actually doing something. Up until that point, all the things that had happened to me were simply side effects of the chemo' treatment but no indication as to if the chemo' was busy doing its job. To me, this is a sign that it is doing just that and it really made me feel better, not worse, as I had expected it to do. What I didn't realise is that has the hair dies, parts of the head become painful. I didn't like this at all. As I touched my hair and the hair moved direction on my head, the pain was worse. Over the next couple of days, with hair falling in food, sinks, on to me and my pillow I knew I couldn't cope with it for a prolonged period and asked my friend to shave my head. After a little convincing that I really meant it, he did it for me the very next day. My friend (his wife), videoed it and we had a really good laugh. I enjoyed the experience immensely despite it being a little strange. On day 14 we also flew home. The flight was easy and fast and I managed to go out for a friend's birthday that evening straight after we landed and dumped the cases. On day 17 my head was shaved and I felt so much better. My head is still tingling and hurting a little but as the hair isn't moving on my head, the pain is improved. As it is winter I get to wear my favourite hats. To strangers, I look normal as I have eyebrows and eyelashes right now. Inside the house, when too cold for the nudy head look I wear a Buff to keep it warm, or a pirate hat as my son calls it. They are great to sleep in too so I don't become an icicle by morning! I should have had my second treatment on day 14 but due my trip I had a week's respite which has given me even more strength for this time. I had my second blast yesterday on day 21 and followed it with a great veggie curry. It is my firm belief that good times should be had while they can be so off we went for lunch. today I had my injections, did a couple of hours of batch cooking and I am now plonked on the sofa with a cup of lovely English tea writing the blog. I won't pretend chemo' hasn't and won't hit me hard. Each drug will effect me differently and once weekly on the new drug it will be a whole new learning curve. I do feel like Wonderwoman though. I wondered what it would be like and now I know. I wondered how the first treatments would effect me and now I know. I wondered how my family and friends would feel and now I know. I wondered if I could cope and now I know. I can cope and I will cope. I am not the strong person that people think that I am. Being prepared to be outspoken should never be confused with being strong. 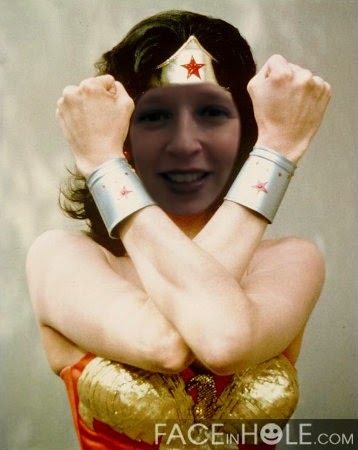 The chemo' has made me feel like Wonderwoman because I am coping and I am doing things I didn't think I could do, when and only when I can, if I can and only if I want to. I have superpowers. The only difference between me and Wonderwoman is that mine don't appear on demand, just in the good moments and I have to take advantage when they appear. Diana Prince signing off, until next time. What an amazing read! Keep doing what you're doing! sending much love to you wonderwoman. Keep up the positivity! When all this is completed, the hair regrowth will be better than before -- that is the case with EVERYONE -- but because of that, take lots of pictures -- perverse as it may be because after it all comes back luxuriant and luscious -- you'll regret not having the pictures. No pain, no gain, as they often say. Share all the love and it will be returned back a thousandfold. Oh -- and you're a good writer.